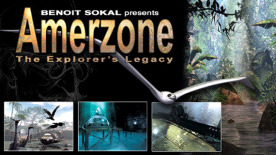 From the creator of the Syberia series, experience Benoit Sokal's first adventure game masterpiece. In 1932, Alexandre Valembois was a young explorer who, with his native friend Antonio Álvarez, wanted to make a name for himself by exploring the mysterious Amerzone region. Befriended by the natives of the region, he witnessed a strange ritual involving a giant egg of the famed white birds. Wanting to prove that the white birds existed, Alexandre betrayed the natives' trust and stole the mysterious egg. Alas, upon his returning to France, nobody believed Alexandre or his journals about the Amerzone. Can you unravel the mystery of the white birds?